Having provided comprehensive electrician services for home and business owners in the Brookline, Massachusetts, area since 2008, VMA Electric offers a level of experience that is tough to beat. 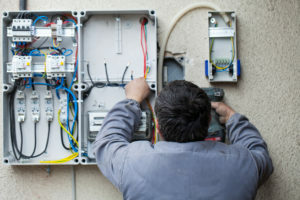 We’re a full-service electrical contractor that focuses on custom jobs, and we can help ensure that your repair, installation, or troubleshooting project is completed in a timely fashion and at a reasonable cost. The range of electrician services we offer for residential and commercial customers in Brookline, MA, includes everything from wiring and re-wiring to the installation of custom lighting, home automation systems, and security systems. We also offer the installation and maintenance of whole-house backup generators, which kick in as soon as the power goes out and can be a necessity when outages occur during the harsh winter months. If you are in need of a dependable electrician that services homes and businesses in the Brookline, MA, area, contact VMA Electric today.